Analogue Vista Clock is an outstanding quality alarm clock for your desktop. This awesome clock is a desktop extension - it will stay on your desktop ignoring all mouse and keyboard input, so it won't interfere with any other application. 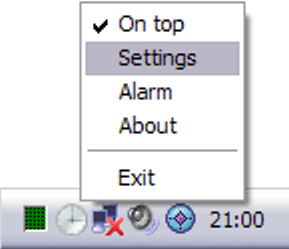 The communication with the clock, including changing the size, position, transparency level, alarm hour and more, is done using clock's tray icon. Analogue Vista Clock is fully configurable, it allows you to change its appearance - it comes with six superb Vista-look skins, but registered users can download more or make their own skins! 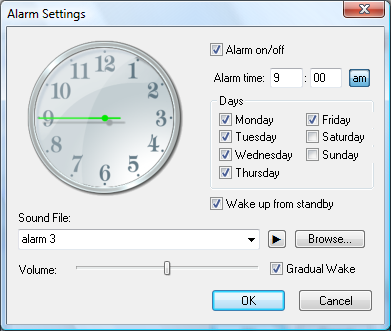 It lets you choose from 5 built-in alarm sounds, but you can use it to play any file you want or even randomly play sound files from selected folder/directory. You can define which days of the week alarm should be played. 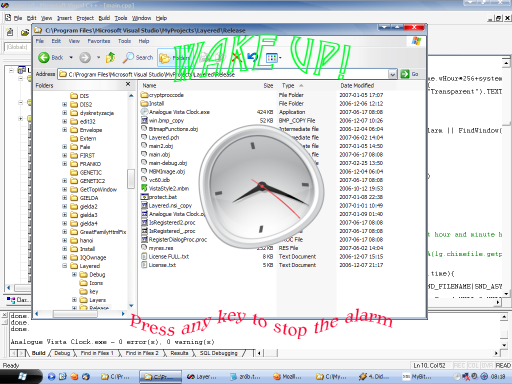 Furthermore, if the alarm is set and the clock is running, it will wake up the computer if it is hibernated or in standby mode. Analogue Vista Clock ver. 1.35 works under Windows 2000, Windows XP, Windows Vista, Windows 7, 8 and 10! 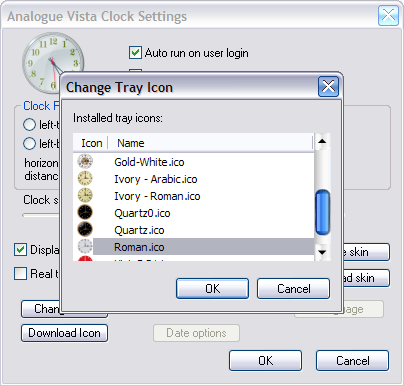 If you are registered user of Analogue Vista Clock then you can download new Analogue Vista Clock skins or make your own skins! 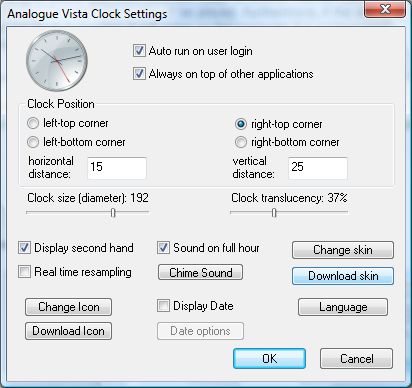 For more information go to the Analogue Vista Clock's skins page. If you have version 1.08 or newer you can download additional tray icons for your clock. You can use our Shutdown Screensaver to hibernate your computer whenever it is left unused for longer time. Analogue Vista Clock will automatically wake it up in the alarm hour! More tips and tricks. Don't miss this great bargain, purchase our outstanding alarm clock today! A family license allows the installation and use of the clock on every computer in a single household. Business licenses are generated to the company name and allow to install the clock on up to 5 computers within the company. All upgrades for registered users are free!